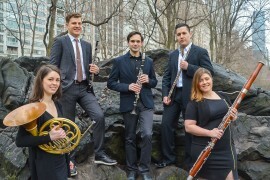 New York based chamber ensemble ALTIUS WINDS began in 2012 as a collaboration between five in-demand classical musicians, entrepreneurs, and arts advocates looking to create a relevant, forward-thinking approach to their art form. Since its inception ALTIUS has reached audiences across the five boroughs with performances in the recital hall, classroom, gala dance floor, and beyond. Altius Winds continues to push the boundaries of classical performance through the pursuit of new commissions, collaboration with other art forms and performance spaces, and audience engagement.